Review: Luke Skywalker joins forces with a Jedi Knight, a cocky pilot, a wookiee and two droids. Their mission is to save the universe from the Empire’s world-destroying battle station. While doing that they are trying to rescue Princess Leia from Darth Vader. 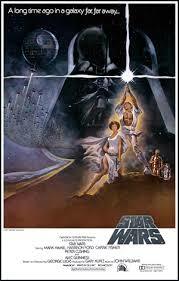 The best Star Wars film ever to be made. George Lucas was so sure that the film would be a flop that he went to Hawaii with his good friend Steven Spielberg and didn’t attend the Oscars. While in Hawaii they came up with Raiders of the Lost Ark (1981). When this film was first released in 1977, this movie was simply titled “Star Wars“, as it was intended to be a stand-alone movie. George Lucas based the character of Han Solo on his friend, director Francis Ford Coppola. The first character that he created for the story is Darth Vader. At the Academy Awards in 1978 this won 6 Oscars. They were for Best Art Direction-Set Decoration, Best Costume Design, Best Sound, Best Film Editing, Best Effects,Visual Effects and for Best Music,Original Score. A Special Achievement Award went to Ben Burtt For Sound Effects. At the Golden Globe Awards the same year it won with Best Original Score – Motion Picture (John Williams). At the Bafta Awards in 1979 John Williams won an award for the Anthony Asquith Award for Film Music. This film also won a Bafta for Best Sound. This is on Barry Norman’s list of 100 Greatest Films of all time that he produced at the start of 2012 in the Radio Times. One film critic wrote about this film “Endlessly imitated but never rivaled, this opening installment of George Lucas’s original space trilogy dresses up the timeless tale of good versus evil with ground-breaking special effects and a dazzling array of intergalactic characters”.